Exeter University Athletic Club ended their track and field season in style with the highest number of personal bests attained by any University represented at the BUCS Visa Outdoor Athletics Championships, held in the Olympic Stadium on May 4th-7th. As an event in the London Prepares series, it was a once in a life time experience for those who competed with 40,000 spectators watching in the stands. Friday evening saw a strong start to proceedings by Exeter, with Chris Tucker in the 400m hurdles and Tyler Johnson and Becca Jones in the 100m. Tucker and Johnson attained season’s bests and Jones achieved a personal best. Johnson qualified for the semi-finals in the 100m where he ran just outside of his time set the previous evening. Continuing his success in the 200m, Johnson replicated his BUCS indoors performance and qualified for the final, securing a lifetime best in the process and further improving the university record. Monday saw Johnson finish 7th in a closely contested final, where there was less than a second between all the athletes. Representing Exeter in the 800m, Helena Corbin and Steve List both qualified convincingly for the semi-finals, with List running a personal best and showing promise for even greater performances in the future. Kate Kaye mirrored their success in the 1500m where she qualified for the semi –finals and battled with other athletes to be rewarded with a new personal best, narrowly missing out on the University record. Beth Hampson kicked off the field events, competing in both the long and triple jump over the weekend, whilst Ian Whittaker attained a personal best in the triple jump, in his third ever competition in the discipline. Will Cullen and Ollie Garrod tackled the men’s 5000m and 10,000m races respectively, with both being rewarded with a personal best upon completion. Saturday evening saw the relays, which were ran within the packed stadium, the atmosphere was amazing with UKA races ran between the University races, giving the athletes a taste of what athletes like Usain Bolt and Jess Ennis will experience this summers. Abbie Rudd, Laurence Thill, Jemma Neate and Kate Kaye ran a strong performance in the women’s 4x400m against tough competition whilst Laurence Thill, Beth Hampson, Hannah Gladstone and Becca Jones held their own against Brunel and Birmingham in the 4x100m. The men’s 4x400m quartet of Tyler Johnson, James Clayton, Steve List and James Meadows put in a brilliant performance in the men’s 4x400m beating EUAC’s club record by four seconds, narrowly missing out on a place in Monday’s final. Finishing up Exeter’s relay squads were the men’s 4x100m which consisted of Andy Boulding, Ian Whittaker, George Derisley and Tyler Johnson, who ran a skilful relay. Other notable achievements over the weekend came from Laurence Thill in the women’s 200, Kate Stockings in 2000m steeple chase, Abbie Rudd and George Derisley in the 400m, who all ran personal best performances. Alex Warna, Exeter’s national hero ran a decent 1500m, running ever closer to the Sri Lankan national record, whilst JJ Blackstock was a valuable member of the team. 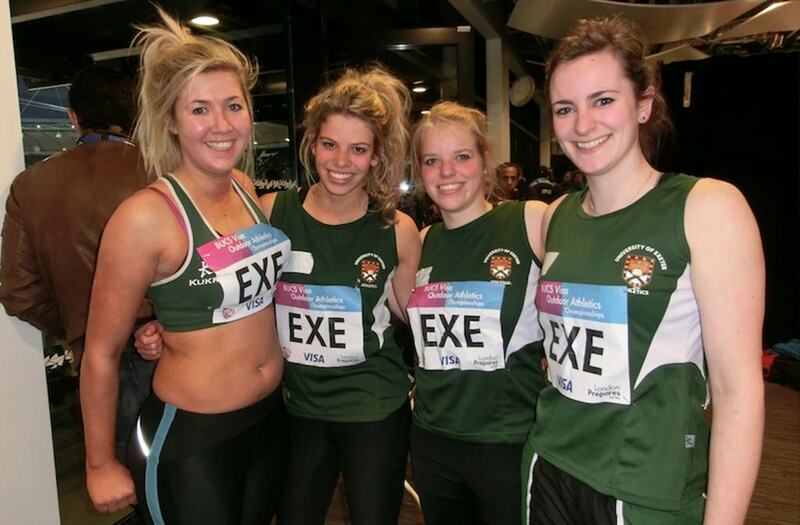 Overall, despite the sometimes less than ideal conditions, Exeter University Athletics Club showed that you do not have to be the biggest or most well-known university to achieve great things at the BUCS championships, but it’s down to the training, and the hard work both we and our coaches put in. So many thanks to Sonya Ellis, Mike Hawkins, Dave Morgon-Owen and Rob for their coaching this year. This was a fantastic experience and achievement for EUAC and I think all would say the loss of voices by the end of the weekend was worth it for such a great team atmosphere, our supporters and athletes did the Green Army proud.